No, I have not cooked with capers. I still don't even know what capers are, actually. This post is not about capers! It's about adventures- with cabbage! Until about a week ago, my only experience with cabbage was to slice it up VERY small for my mom's world-famous oriental chicken salad. The salad is to die for and my brother has confessed that he thinks he could eat it every day for the rest of his life. But, as I said, until recently, this wonderful salad was my only foray into the world of cabbage. 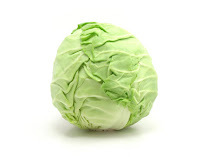 I am not a saurkraut fan, and I always had this picture in my mind of cooked cabbage being kind of like spinach. Wilted. Green. Mushy. Not very appetizing. But, my husband seemed to think it was good. So, I thought, why not? I am really into trying things I've never tried lately, so why not add cooked cabbage to the list? Good heavens, I just tried sushi the other night with some friends- cooked cabbage can't be scarier than that! So, my first recipe was one for the crock-pot. A safe-looking "Pork & Cabbage Dinner" from the Fix It and Forget It cookbook. I must say, I was nervous when I put in the pot in the morning, though it was very simple. I was heartily convinced that a tablespoon of parsley was far too much, but in it went. Hours later, we came home from being out all afternoon and boy, did the house smell good! (That is one of those things I absolutely LOVE about the crock-pot...you can leave the house all day and come home and it smells like you've been slaving away all afternoon!!) That seemed to be a positive sign. I wasn't sure what goes with cabbage, so I played it safe and whipped up some instant mashed potatoes. When we finally sat down and tried it, it was delicious! The pork chops were tender and full of flavor (guess that over-abundance of parsley had it's place! )- fairly falling apart, and the cabbage and mashed potatoes complemented each other perfectly. But, despite the wonderful flavors, I was right. It was ugly. You know, I absolutely love good food. But I also love pretty food. It bothers me when food is ugly. And this was ugly. The cabbage, just as I suspected, was green. And mushy. Very unappealing. But, I suppose you could consider this test a success, for it was tasty! But the unattractiveness of it still gnaws at my artistic sensibilities. "Hearty Beef and Cabbage Soup"
1) Saute beef in skillet; drain. 2) Combine all ingredients except cabbage in slow cooker. Hmmm, I might have to try this at some point. I'm used to ugly factor...but only in egg form. I don't know if Josh has ever made a pretty omelet yet ;) But they sure are tasty!